This disc wears a ‘minor masters’ look, a fact happily attested to in the sleeve-notes. The focus is on the music of two contemporaries – Florent Schmitt and Jan Ingenhoven, the former very much better known than the latter – and the somewhat younger László Lajtha. Stylistically speaking one senses the move from Late-Romanticism in their music toward a more varied palette, and to more plural directions. Schmitt’s 1918-19 Violin Sonata has always kept a single toe in the repertoire – Jean Fournier recorded it decades ago, but more recently Régis Pasquier did so for Auvidis Valois on V4679. Freely rhapsodic but compellingly, indeed – for the piano – often ceaselessly active the opening of the two movements is a slow one marked ‘without exaggeration’. Some fluttery avian writing for the violin is matched by some responsive and full-bore piano statements. This movement is explicitly contrasted against the ensuing one which is significantly longer and more volatile, not least in its terpsichorean address. The rolling and driving resinous playing becomes increasingly factious though along with the biting drama comes lyrical reminiscence too. The nostalgia, though soon swept away by increasingly terse motifs, remains pervasive here. For all the superficially loose harmonic direction, the music is strongly constructed and frequently compelling. Certainly it receives a strong and assured performance here. 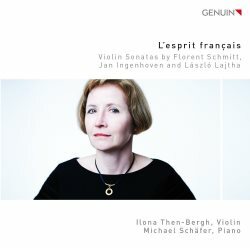 Schmitt’s Dutch contemporary Ingenhoven is represented by two very different and very compact violin sonatas at a diametric remove, stylistically, from Schmitt’s hothouse. The Violin Sonata – not numbered as No.1, but completed in 1920, the year before Sonata No.2 - is in one movement but with four fairly clear sections. It’s refined, elegant, and compressed writing with a fresh lyric slow section. The slightly later sonata is equally short, at just over nine-minutes, is full of fancy and some flighty decorative writing for the violin. Whilst never fully distinctive, it’s also never dull. A generation younger than Schmitt, the Hungarian László Lajtha completed his Sonate en concert in 1962, the year before his death. It’s an intriguing work, with a folkloric hint, but hints too of Poulenc. There’s plenty of drollery in the writing, which is also on occasion taut and tart. The slow movement reveals its ethnic slant in particular, with the fiddle taken high and the piano exuding cimbalom sonority. The writing is warm, the song well sung. To top things off, there’s a purposeful and exciting finale. Here’s a sonata that should really be better known. The programming juxtapositions work well here, and the well-recorded performances from Ilona Then-Bergh and Michael Schäfer are thoroughly persuasive.